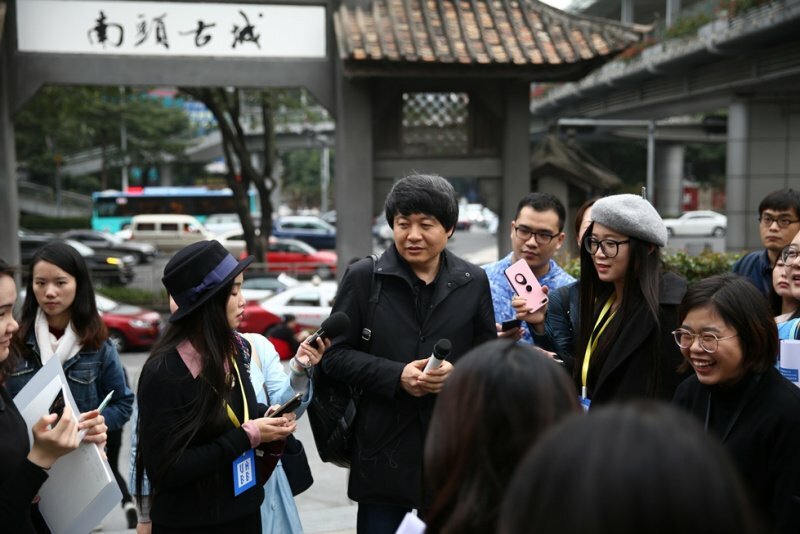 Meng Yan leads a media preview around Nantou Old Town. Courtesy of UABB. A street performer at UABB, in front of WEGO, an installation by MVDVR. Photo by Herbert Wright. Nantou’s East Gate. Photo by Herbert Wright. Nantou Old Town with the new Baode Plaza and its two new two-storey buildings by Urbanus. Courtesy of UABB Organizing Committee. Hong Kong and Shenzhen share the Urbanism/Architecture Bi-city Biennale (UABB) – but Shenzhen is the major platform with a big message. 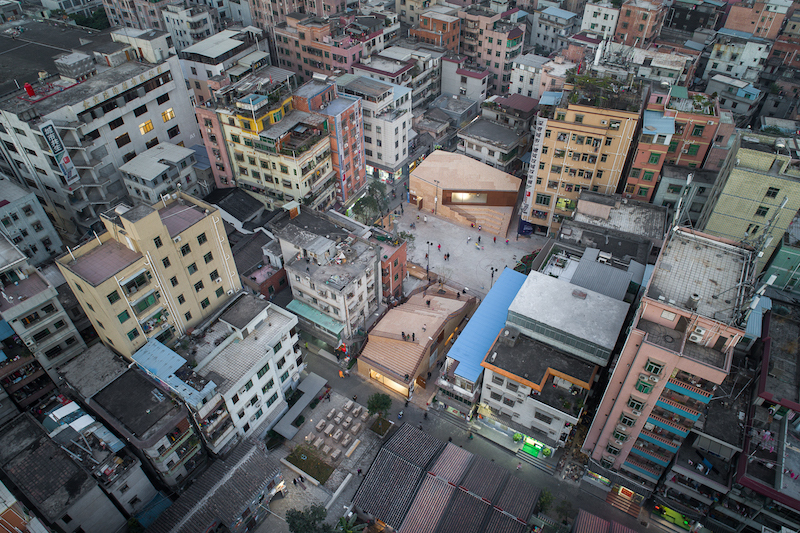 Curated by architects Meng Yan and Liu Xiaodu of practice Urbanus and MAXXI’s artistic director Hou Hanru, and with the theme of ‘Cities Grow In Difference’, UABB Shenzhen focuses on the urban village, which is threatened by development and even hip gentrification by art world. 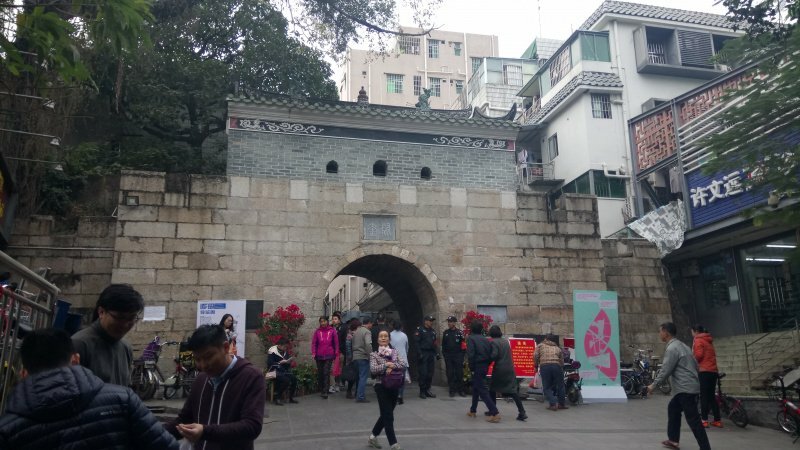 UABB Shenzhen is city-wide, but its main venue is a central urban village called Nantou Walled City. We all know how Shenzhen exploded into existence since the 1980s, but Nantou actually dates from 331AD. 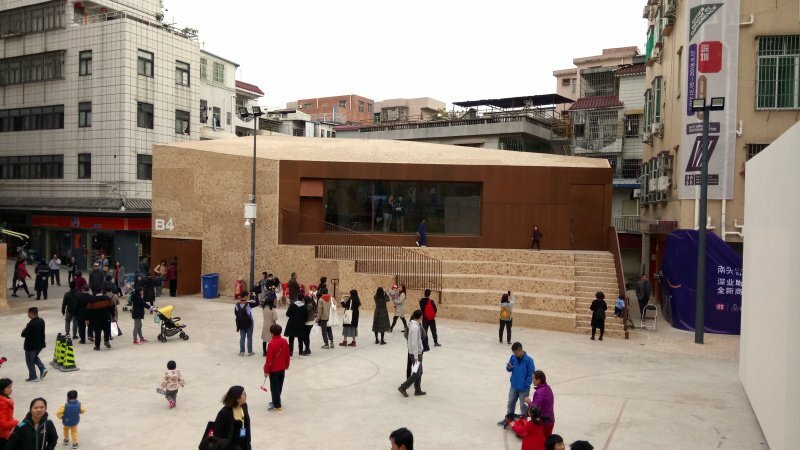 Urbanus have transformed a disused factory into a complex of exhibition venues, installations and spaces, and created new community buildings and a public plaza in the heart of Nantou. Worldwide, dense urban villages provide fantastic models of how cities can operate. These close-knit communities with deep roots are vibrant, sustainable, busy with streetlife and commerce, full of local character and endlessly varying townscapes. In its rush to modernise, China has been destroying its urban villages, but attitudes are changing. Urbanus has been a key element in that change, but as its co-founder, Beijing-based Meng Yan, says, UABB Shenzhen is ‘the first time in the world a biennale has been held in such an area’. CoBo talked to him in Nantou. Have Chinese attitudes to the urban village changed since your Shenzhen Pavilion at the Shanghai Expo 2010 hosted its exhibition about Dafen (the urban village famous for copying masterpiece oil paintings)? 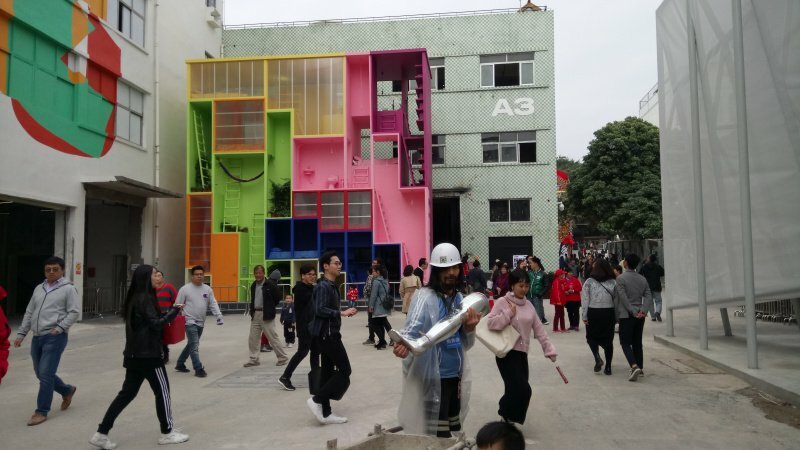 People’s general attitudes toward the urban village started to shift — actually starting from the very first (UABB) Biennale in 2005, held in OCT (Shenzhen’s hip creative quarter, an ex-industrial zone regenerated by Urbanus). That is a critical moment when the Shenzhen Government decided to deal with the urban villages issues. The method of course at the time was to get rid of (them), as quick as possible. They said they wanted to demolish all the urban villages in 5 years. Five were demolished… luckily enough, that ambitious plan wasn’t totally successful. At that time the general conception of urban village (was) almost unanimously thought of as a cancer and that it has to be dealt with — dirty, pollution, crime, prostitution… But because of the first Biennale, the urban village problem was put on the table. Subsequently, the city started to think, “maybe that plan was too ambitious and maybe we should treat urban villages differently.” That was big progress. What differences does it make that Nantou has been here for so long, compared to the other urban villages? Nantou is an interesting story, because it has a whole history of a city for over 1000 years. It became a typical village after the communist party took leadership after 1949… and then after 30 years of urbanisation, once again became urban. People don’t know the hidden history… some people in Hong Kong do know, because they were separated from Nantou. At one point Nantou controlled a vast point of terrain containing Hong Kong, Macau, a lot of places. So it is really intentionally, and unintentionally, hidden. Has the Party kept this history hidden to enhance Shenzhen, whose explosive growth the world looks at it in amazement? Yes, it’s a miracle. (But) I wouldn’t say that. People are really interested to catch up with the rest of the world. History really started from the late 70’s, when China had been so poor in the past and the only thing that really attracted everyone was modernisation and urbanisation and whatever was new. We know we have thousands of years history, but that is the past. Thats why you see new buildings and new company towers built, we’re the most enthusiastic in the world, probably. Gradually, people start to realise. As you grow up, you start to think about your past. If you are young, you don’t care, you don’t have awareness of the time. When you are 30 or 40 years old, you start to think about where you come from and look back at history and have a nostalgic feeling. It’s a sign of growing up. Chinese cities look more and more the same. Can the urban village play a role in keeping the differences? Definitely, the reason why I think we chose (an) urban village as the main venue is really to bring people here on site, to experience, reflect, to reveal and relook what’s around us. Which is the real city, which is not? (Nantou) is a very specific site that most people have never been to. Even people living in Shenzhen, they don’t want to come here because it’s so close, its encircled by the city, but there’s a very big psychologic distance, there’s a hidden barrier almost. (It) exists in all of the urban villages. By stereotype, its dirty, not good, no light. In the (UABB) news conference I said, don’t just look at the exhibition, this is a teaser. You just follow the signs and come to the urban village… The exhibition is when you look around and see real life, the hustle and bustle, diverse and vibrant reality. This is what we want to show. Yet when you walk around some more recent housing, you see people have managed to create a lot of life anyway. There’s stuff happening in the alleys. Is the human spirit trying to recreate a new urban village? I would agree. There is always an internal kind of force, to create their own, sort of homely feeling. They want to create their ‘own’ something… I think it’s really important to rethink and reflect the modernist ideal of uniformity, monumental, kind of uniformed model of future. Seems like everyone should have one dream for the future. But we think that it’s time to think about multiple dreams, individual dreams, all these smaller dreams may one day become the China dream. Not the Chinese dream, but the China dreams — a collection of individual, different dreams. Is the Party worried that urban villages may encourage different opinions? I wouldn’t include any political statement, not only to be safe but also I don’t think the purpose of the Biennale relays to any of the political issues or concerns. But purely from the urbanistic point of view, how to make the city more diverse is what we found out in the urban village. If we took at the individuality and diversity, its because there is a mechanism behind it … individual house owners have their own rights to renovate or to rebuild their own house. Look at the fabric of the city, all of a sudden you can recognise those areas where you have smaller pixels. Most of the city you see… towers and shopping malls, and theme parks, boulevards. But all of a sudden you see this almost walled city, which contains smaller streets and is a very intimate scale, and very diverse, very vibrant, seems never complete. This is what I feel is rather interesting, and what counter-reacts to the urbanisation outside. It reveals an alternative model. It’s not that we love urban village (or) say “just keep it dirty, just keep it what it is.” This model of urban development is self-sponsored, self-motivated, diverse… (It) can give us more ideas about the future. Does UABB address gentrification, and could it actually become part of the problem at Nantou? It is definitely a problem that we have been experiencing in the past several years. If you think about (Art District) 798 in Beijing, it’s very quickly turned into a commercialised, hip place for middle class consumption… less and less creation, but more and more consumption. And we are facing a similar problem at OCT, which we created ten years ago. We are aware of that problem because we had that experience before. We know Soho today in New York — all luxurious cars parking on the street, and no artists at all, unfortunately. So we were very cautious at the beginning, to how much we can do, and how to do it. Two things; number one – something has to be done, because by keeping what it is, is not going to save Nantou. Because someone (will) want to tear it down… Even the villagers — we did a lot of interviews. If you go ask around if they want to keep their building or if the government allows to rebuild 20-30 storeys, they say yes. They want to get rich. (Secondly) Nantou … is entitled (designated) as a historical town. Because of that, we see the opportunity of keeping it, and we can offer some help to keep it at first, and then figure out a way to improve it. What’s the story with the Nantou factory wall? It’s a very ordinary wall, (it) separates the factory area and the village. So what we would like to do as architect, planner, and curator is to get rid of the wall, and allow people to come to the factory area. We open it up, make it a public space. I still think this is a great idea. What we found out later on after very detailed investigation, there were people who built their informal settlement behind the wall. If we divide the wall, we have to remove twenty houses, maybe a lot of people. So we found out their secret, then we stopped. We didn’t tell anyone, not the city. We said, lets keep the wall because we could have artists paint on the wall. We have 100 stories like this.